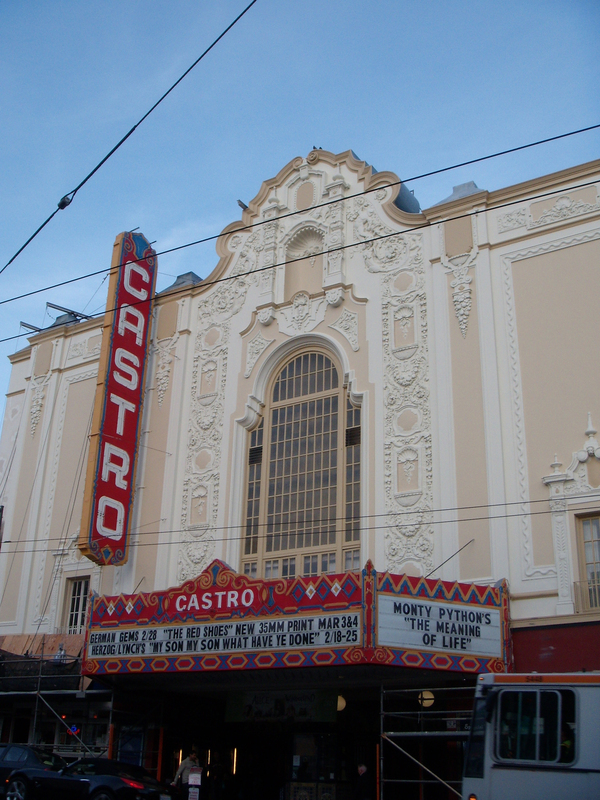 The Castro Theatre, architect Timothy Pflueger’s first movie palace from 1922, is showing off a fabulous new exterior coat of paint. Now highlighted are the Spanish Baroque details of the exterior. A repaired hidden spotlight, when lit, illuminates the shell motif above the centerpiece mullioned window. Combined with the repairs in the late autumn of 2007 of the signature neon vertical, which was architect A.A. Cantin’s 1930s contribution, the theatre is looking quite de-lovely. The vertical sign and the marquee were repaired and painted for Gus Van Sant’s Academy Award winning movie, “Milk,” in which Sean Penn won the Oscar for best actor his portrayal of one of America’s first openly gay politicians, Harvey Milk. Many scenes were filmed in the neighborhood. 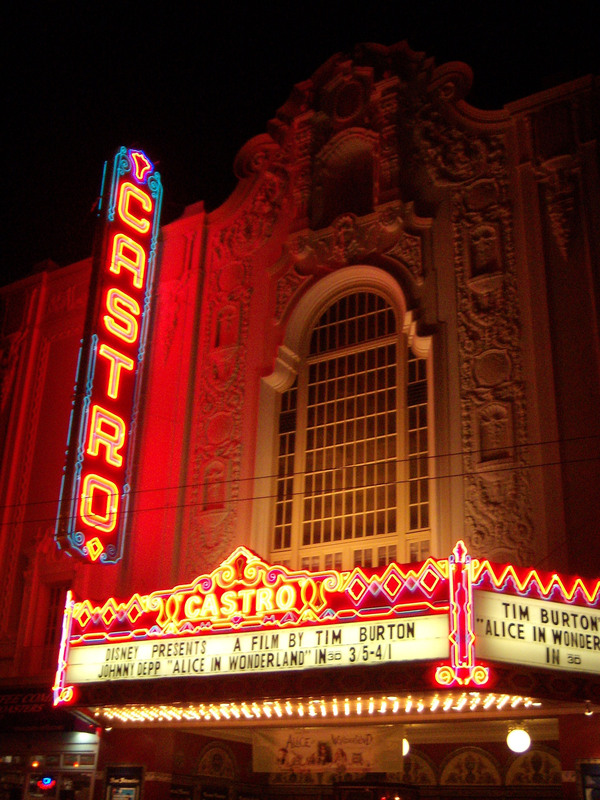 During the filming, there was a security guard stationed at night outside Milk’s former camera store, Castro Camera at 575 Castro, which was restored to 1970s retro perfection for the movie. You can read more about the filming in early 2008 here in the San Francisco Chronicle. Here is a daytime look at the freshly painted theatre. 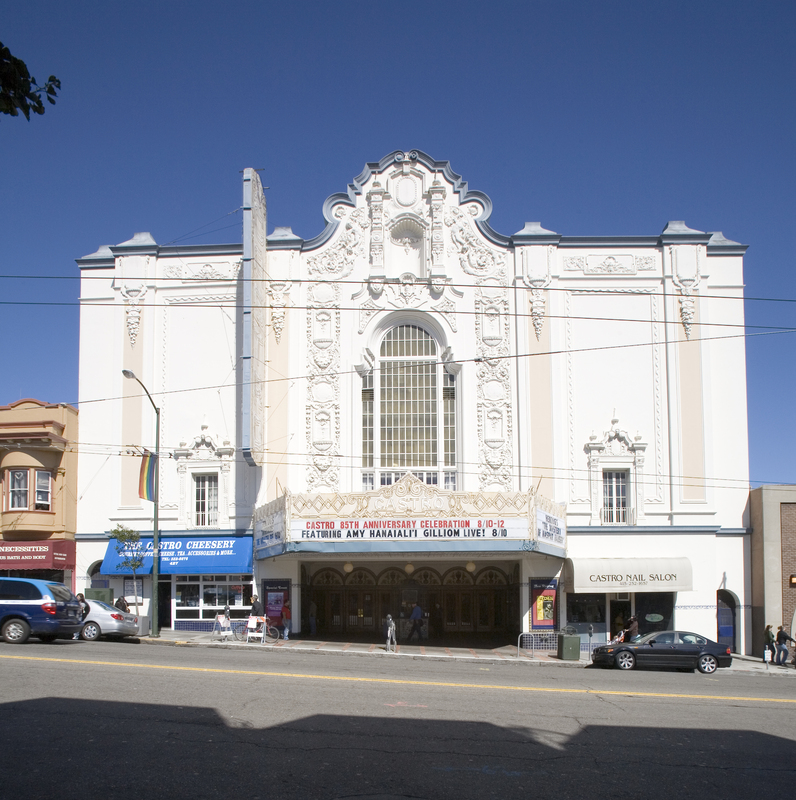 Events producer and manager Bill Longen said the goal of the project was to stay as close to the theatre’s original colors as possible. It’s quite a contrast to a few years ago. Churrigueresque details now stand out amid a darker and more pervasive beige. A deep red brings out the neon vertical, marquee and shops. The photo below shows the theatre in the summer of 2007 when Tom Paiva and I (I was the assistant!) were shooting photos for our book Art Deco San Francisco. What a difference a paint job makes!